FND print & Promotions offers one of the leading online food management system for restaurants, pizza & takeaway which help to send, receive & pay online order for absolutely free. Have you been using any online food ordering system or Working with JustEat / HungryHouse style online food ordering companies. Are you happy with their commission charges? If you answer both above questions as "NO" you are on the right page. As FND Business Media and Marketing solutions we offer Your own online ordering website / Apps branded to your business. Using online food ordering companies could be easy for you as you may not have experience of marketing and may be not consider yourself as technology gig. So using this kind of companies and paying commission could be the easiest way out for you when you start. But obviously it is not the best cost-effective way to continue forward. What we are offering here is a unique opportunity within the Restaurant and Take away technology. 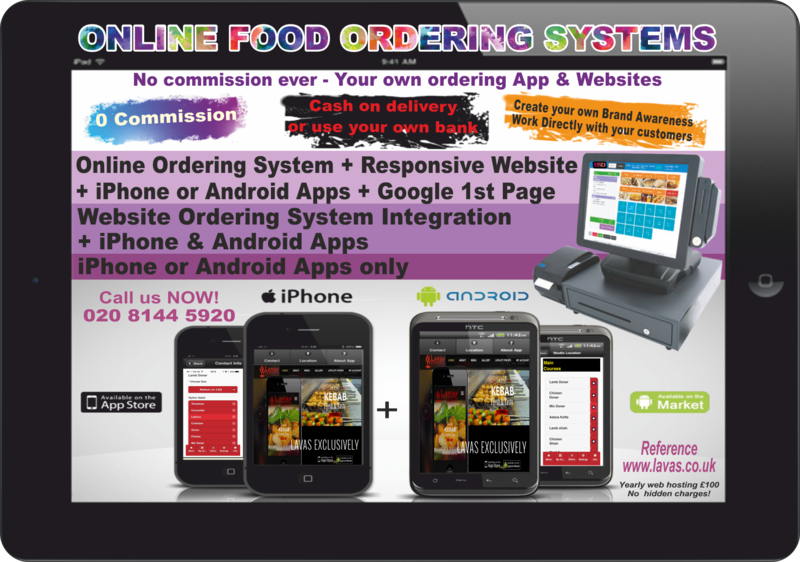 Our Online food Ordering System for Takeaways, Restaurants, Sandwich Shops and Cafes. Get your business online without any monthly fee or commission to your sales. FND online takeaway ordering software is not only stand-alone system. It can be integrated Epos System. Epos software website ordering system with our Epos pos Touch Screen system Cash Register Till, it is full software for online takeaway ordering. But when you work with FND print Not only benefit from cutting edge software and website we also help you to be on the Google first page results as well as Google map and Google business results with the important search terms. Our Personalised Online Ordering System for Restaurants and takeaways offers responsive, mobile compatible websites which Increase revenue with a custom online ordering system for your restaurant. If you order online our full Online Food Ordering System for Takeaways & Restaurants package we will install and test all your Online Food Ordering System and apps free and even allow you to use your own computer and printer. Our aim is help you as much as we can, not to pay any monthly fee or commission to other companies and use your own system and printer without asking you purchase additional devices. We also offer new technology thermal printers these printers has the ability to ring like phone. So when you have the orders, it is not only automatically printing the order it is ringing and letting you know that you received your order. Also our system allow you to respond the customer as soon as you receive the order and you can tell them that their order will be ready within 25 minutes for instance.